* The following was a presentation given on November 8, 2008 for the World Affairs Council of Houston’s Global Issues in Depth – Portrait of Southeast Asia. The early Homo populations settled in Southeast Asia and extended northwards and eastwards to China and Java by perhaps 1.5 million years ago. The movement of the anatomically modern humans that crossed the sea gaps of eastern Indonesia to reach Australia, New Guina and possibly the Philippines around 35,000 to 40,000 years ago. The Americans were reached more recently, perhaps about 14,000 years ago. Source: A Cultural History of Southeast Asia: From Earliest Times to the Indic Civilizations,edited by P. Bellwood and I. Glover. Routledge Curzon Press, New York (2004). But Southeast Asia is an imagined reality: Is Southeast Asia a jigsaw puzzle or a collage? Source: A Cultural History of Southeast Asia: From Earliest Times to the Indic Civilizations, edited by P. Bellwood and I. Glover. Routledge Curzon Press, New York (2004). Vietnam under Nam Viet Kingdom before its conquest by the Han empire in 111 B.C. 500s-700s A.D.: the kingdom of Chenla suspended Funan. Chenla was later split into upper Chenla and lower Chenla. 800-1400 A.D.: the classical age of the Angkor period emerged. At its height, it held territories that are now part of Thailand, Vietnam, and Laos. This period marked the construction of the massive temple complexes known as Angkor Wat and Bayon and the imperial capital of Angkor Thom. Immigrations of Tai peoples occurred from the 10th to the 15th century, of Vietnamese beginning in the 17th century, and of Chinese in the 18th and 19th centuries. 1863-1940: French intervene militarily and Cambodia becomes French protectorate. The region becomes part of French Indochina along with Vietnam and Laos. French colonial capital located at Phnom Penh. 1940-1945: French Indochina was under the control of the Japanese military. 1954-1970: Independence from French; Kingdom of Cambodia under Prince Norodom Sihanouk who abdicates throne to become elected President. 1970: Coup against Sihanouk establishes General Lon Nol as President of a U.S.-backed regime called the Khmer Republic. Between 1975 and 1979 the country was devastated by the reign of the Khmer Rouge, a rural communist guerrilla movement. During the Khmer Rouge’s period of power, at least 1.7 million Cambodians were killed or died. The unrest of the 1970s led more than 300,000 Cambodians to emigrate. Of these, more than half (some 179,000) went to the United States, more than 50,000 to France, and 45,000 to Australia. In 1979, Vietnamese troops invade and overthrow Pol Pot’s regime. A fragmented coalition government is formed where Vietnamese puppets compete for power. In 1989, Vietnam officially withdraws from Cambodia. “Above all, the States participating in the Conference commit themselves to promote and encourage respect for and observance of human rights and fundamental freedoms in Cambodia. 1998, Pol Pot, former leader of Khmer Rouge, dies in forest hideout, never brought to trial. Thematically, Cambodia’s history can be thought of as collapse and regeneration. However, seats of power shifted across space or geographic shifts in the center of power, many aspects of ancient Khmer society remained relatively constant through the centuries. The country has a constitutionally independent judiciary composed of lower courts, an appeals court, and a Supreme Court. The court is responsible in resolving electoral disputes. However, Cambodia’s ruling party has been able to manipulate. 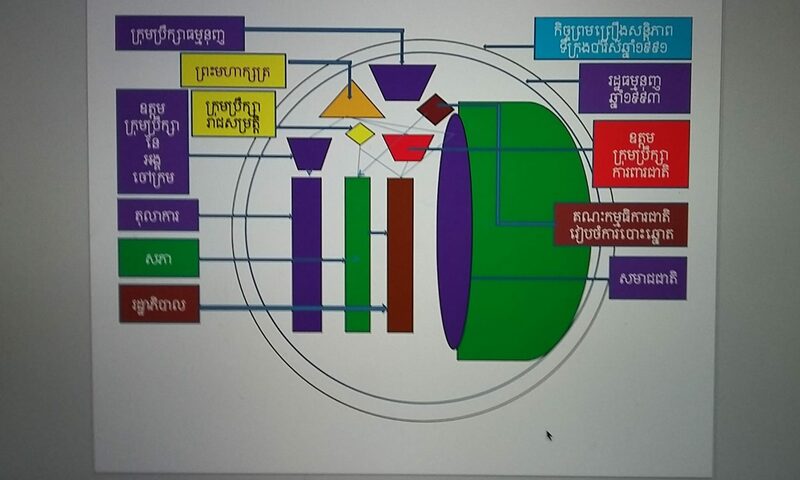 There are three major political parties in Cambodia are the Cambodian People’s Party (CPP), Sam Rainsy Party, the FUNCINPEC Party. Previously a party had to secure two-thirds of the seats to form government and no party was able to do so. The Constitution was amended with the support of the opposition to allow any party which obtained more than 50 per cent of the seats to form government. Cambodia is nominally a democracy and has democratic mechanisms in place and can enhance it to solve its internal affairs independently and responsibly. On 27 July 2008, Cambodia held its fourth parliamentary elections since the 1993. Despite evidence of fraud and voter intimidation, the 2008 parliamentary elections saw less violence than previous elections, better technical organization, and more open campaigning across the country. The CPP’s victory is the result of strategic planning to maintain and legitimatize its dominant role. “Politics is useless and worthless for me to think and care about. My top priorities are money and work, because that’s what will help me improve my lifestyle,” said a young female Cambodian. Approximately half of the total government budget made up of foreign contributions. China’s influence in Cambodia has increased substantially. The effects of development and progress in Cambodia depend on where one lives in Cambodia. This uneven development reflects the concentration of power and wealth in the hands of local officials from foreign aid. In the coming years, unbridled economic growth at the expense of the more vulnerable in the population and high levels of uneven development. The environment is also suffering, with topsoil erosion and flooding becoming prevalent. The spread of HIV/Aids is another threat; however, public health campaigns have reduced the rate of infection. Cambodia may reap billions of dollars in new revenues from offshore oil and gas fields in coming years. U.S.-based Chevron found promising oil deposits at offshore test. Preliminary estimates of the recoverable reserves are 400-500 million barrels of oil and 2-3 trillion cubic feet of gas. Cambodia’s total reserves could run as high as 2 billion barrels and 10 trillion cubic feet of gas, according to the World Bank. “Some people are worried about the Nigerian disease, saying that it should not be allowed to reach Cambodia. I have told them that Cambodia is not that stupid,” the prime minister said in remarks reported by the Associated Press. The Communist Party remains the dominant political force. The party is entrenched in state institutions and mass organizations. The party selects future leaders and senior officials and gives them extensive mid-career training, some of it highly ideological. The politburo, which currently has 14 members, is the party’s executive and sets government policy and vets all major appointments. It is elected by the 160-member Central Committee at national party congresses, which are held roughly every five years. The military is influential and ranks in influence only behind the party and the government. The army has always had a political dimension. Vietnam was supposed to become the next Asian Tiger. The country’s economyhas grown, on average, 7.5% every year over the past decade. Also, gdp per capita had increased to $833 in 2007 from $100 in 1990. Other things being equal, Vietnam’s miraculous growth is based on one-time changes of adopting capitalism as the basis of economic life; in that respect the country started from a very low base. Although these changes were by no means easy or painless, they cannot be replicated. The country’s rapid growth was more or less, characterized by inputs, such as mobilizing the rural labor force for industrialization, attracting fdi inflows, and heavy investment. Vietnam’s miraculous growth has not been accompanied by appreciable gains in efficiency or productivity growth. A study by the adb found that Vietnam’s growth from 1996 to 2004 was largely the result of capital and labor. Meanwhile, total factory productivity-measuring the efficiency with which labor and capital are combined in the output of the economy-decreased to 16.6% from 62.1% over the same period. This illustrates Vietnam’s inefficient use of scare public resources, weak governance resulting in higher transaction costs, and lower labor costs that insufficiently compensate for the lower level of productivity. At around 23% for the first nine months of 2008, the country’s inflation rate is at its highest level since 1991, when inflation hit 67%. The inflation rate jumped to a high of 28.3% in August from a high of 25.2% in May. The prime minister has also taken a contradictory stance-namely fighting inflation in a “flexible way” to achieve high growth rate. For economists, there is a trade-off between inflation and economic growth. “If you look at historical lessons of many countries in controlling inflation, stabilizing macro economy, actually you will almost never find any country which has succeeded in controlling inflation and at the same time promoting growth,” warned Ayumi Konishi, the Asian Development Bank’s country director for Vietnam. This perspective was echoed by the Economist Intelligence Unit. Its forecast projects Vietnam’s gdp growth will slow to 4.9% for 2008 and 4.6% for 2009, and cpi will drop to 15.2% in 2009 from 25%. Meanwhile, the ADB believes that Vietnam can exceed the ADB’s gdp projection of 6.5% for 2008 and 6% for 2009. However, Vietnam would do so with “the cost of higher inflation and widening trade deficit,” according to Mr. Konishi. The financial turmoil on Wall Street is expected to have certain repercussions for Vietnamese market institutions (i.e., local banks and large state corporations seeking partners and foreign capital) and trade activities. Vietnam is vulnerable to a demand-contraction of the United States’ economy and the falling dollar. The report concluded that for Vietnam to achieve a sustained high rate of economic growth over the next 20-30 years it is mainly about politics, not know-how. That political will is the necessary catalyst for reform, so as to localize “best practices” in state effectiveness, firm competitiveness, financial system, and education. But at the end of the day, Vietnam’s intellectuals are arguably right that they cannot get to the core problems of the country’s situation: because they are not allowed to. Until they do, it seems Vietnam will continue to field the weakest players with a head coach that can’t be questioned or fired.